I am starting an occasional feature of store reviews, especially of grocery stores. I will give my impressions of the products, service, and most importantly, the prices in each store. My "research" is of course based on the stores in my Northern Virginia area; prices and other details may vary depending on your location. I put off my first visit to Wegmans for a long time. I had heard enthusiastic reports of how nice it was to shop there and about the gourmet products they carried, and I assumed that they must be correspondingly expensive. Finally, two years ago now, I decided to check out the store to buy some special food items for an upcoming baby shower I was hosting. After two or three trips, during which I experimented first by buying only a few gourmet items and then by filling my whole shopping list, I discovered that I did not just like Wegmans. Baby, it was true love! I have never looked back since. First and most importantly, I discovered that overall, Wegmans' regular prices for the same items I was purchasing in other stores were the same price or cheaper about 80% of the time. Further, the Wegmans store brand is of extremely high quality, so I was able to switch to cheaper versions of some items without sacrificing taste. I have found that Wegmans does not in general have as amazing "loss-leader" sales as some other more expensive grocery store. However, their slogan of "consistent low prices" is really true; sometimes their regular prices are equivalent to good sale prices at other stores. Even though I shop many different stores for great deals, I head to Wegmans for my staples. I feel that if I buy an item there it was at least a good deal. Although they carry the full complement of regular grocery products, Wegmans is much more than a regular grocery store. They have an entire section of organic products, from groceries to toiletries to baby food. They have a wine shop, a gourmet European bakery, an artisan cheese counter, and an olive bar. Furthermore, Wegmans has an entire cafe of prepared foods to either pick up for dinner or to eat in the attractive seating area in the store. The choices range from full dinners such as chicken pasta or steak and potatoes to sushi, soup, and Chinese food. The shopping experience at Wegmans is also top-notch. It is actually fun to shop there! The store is always clean and attractive, and the customer service is usually terrific. When I'm shopping with my little ones, the cashier always asks if I need "helping hands" to get to my car. One day I asked the cashier if I could run back for an item I forgot. She replied, "Let me ask a manager to get if for you"! You can't beat that! I also feel good about supporting Wegmans because they are such an ethical company. They were recently voted one of the "100 Best Companies to Work For" for the twelfth consecutive year. They give thousands of pounds of food to local food banks, and they support local charities. They also work with some local farmers and suppliers. If this review sounds enthusiastic, it is! It seems that often one has to sacrifice quality or service in a store in order to save money, but Wegmans has the whole package. The attention paid by Wegmans to all the consumers' needs is what will keep me always coming back. And now for my exciting news . 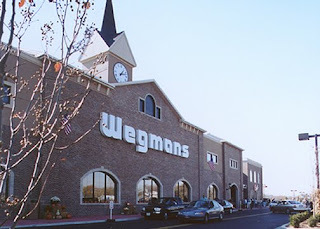 . .
As of today, I will be partnering with Dana of Frugal in Virginia to provide the best deals at Wegmans every week to her readers. Check out this week's deals here and check back every Tuesday for the updated deals. Also, always check out Frugal in Virginia for the weekly deals in your other Virginia area grocery stores. The local Fox channel had a segment this morning that I thought tied in well with your review. This link has the video clip with the President of Comsumer's Checkbook, Robert Krughoff. Happy Frugal Shopping! (1) Wegmans send loads of *FREE ITEM* coupons directly to me via snail mail AND e-mail. (2) The quality and selection of the produce at Wegmans is excellent and far superior compared with other grocery stores near me. (3) The "Family Restroom" is amazing! Always immaculate. There is a small, low seat with straps -- just the thing for my youngest to be safely secured while I help my older child on the toilet. There is a sink right in the stall, which makes washing up a breeze. There is a step stool to help little ones at the sink. Anything that simplifies is a welcome relief for mommies with young children.